Running 2 adult teams on a weekend, midweek t20 teams and a flourishing youth section with 4 teams at all age groups, aspiring North Wales Cricket League club Gwersyltt Park CC’s dilapidated concrete batting ends were proving woefully inadequate. 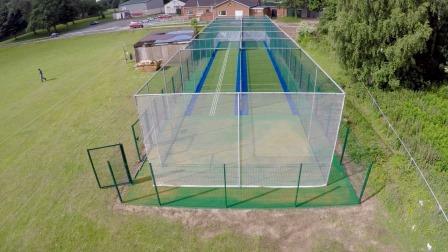 To successfully develop talent, the club’s ECB qualified coaches needed a safer, enclosed synthetic cricket practice nets facility. In terms of funding, tireless campaigning from club secretary Ron Pearson saw the club secure an ECB/Sport Wales Grant and EWCT Interest Free Loan with assistance via Cricket Wales, with remaining funds made up by a grant from Gwersyltt Community Council a contribution of £8k from club itself and finally an ECB/Sport Wales Grant and EWCT Interest Free Loan. With vision set to become reality, Ron guided the club through local council leasing and planning meetings and, with permission secured, began researching suppliers. Visits were arranged to clubs with systems from several suppliers but it was local club Gresford CC, where total-play had installed a similar system some six years ago, that impressed Ron in terms of the facility, its design features, quality and references obtained from the host club. In terms of specification, the club based their design aspirations on the Gresford CC installation but utilising the latest available options on carpets, shock pads, and design features. After some initial desktop investigations and feasibility, total-play visited the site in August 2016 to investigate and finalise proposals. A thorough assessment the proposed build site was undertaken and tests conducted on the onsite soil profile before formally proposing the installation of a system based on the ECB approved ‘tp365’ artificial cricket pitch design. The club also requested bespoke features including a 2m high security system with double access gates to completely enclose the facility, with total-play extending the dimensions of the base construction to incorporate the perimeter walkway. This provided a high quality and maintenance-free artificial turf surround right up to the security fence. 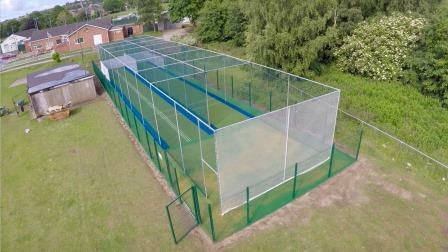 The club also invested in fully enclosed netting with dark green HD Protection Tunnel netting system with full ‘wrap’ batting curtains to provide the safest possible netting system. White training lines woven into one of the lanes were also specified to provide a useful coaching aid.